The Mayan Café presents traditional cuisine of Mexico’s Yucatan Peninsula that since 2007 has delighted diners (and reviewers) in the restaurant row in Louisville’s East Market District, a.k.a. NuLu. And they have done so in part by going all in on sourcing ingredients as locally as possible, a decision that made them a farm-to-table front-runner in Kentucky’s most populous city. Co-owners Anne Shadle and her brother-in-law, Mexico-born chef Bruce Ucán, had already been moving in that direction by holding Mayan Market Mondays, featuring a rotation of producers who sold at Louisville’s main farmers market. Their decision to plunge deeply and irrevocably into farm-to-table came in 2008 after Ucán viewed the documentary “Food Inc.,” a powerful indictment of the nation’s industrialized corporate agriculture system. The owners made a decision to purchase only locally and sustainably produced meats, and to buy as much local produce as they can (while being clear with customers that their cuisine requires some tropical ingredients such as pineapple and coconut that are not grown locally). The restaurant presents a monthly menu featuring a seasonal item: The June 2016 special menu focuses on berries, with a salad that includes strawberries and a jalapeno-blueberry vinaigrette, a steak entree with a spicy berry chutney, and a berry shortcake for dessert. Their commitment to local and sustainable extends to the beverage menu, which features sustainably produced wines along with local craft beers and spirits. And the restaurant has jumped ahead of the curve again in presenting allergen-free items and otherwise accommodating customers with special dining needs. 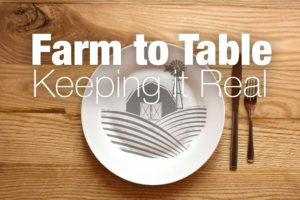 Good Food on Every Table is pleased to present a q-and-a with Shadle and Ucan as our first out-of-Chicago article in our “Farm to Table: Keeping It Real” series. Family Farmed (FF): Please give us some history about the Mayan Café and how you decided to go all in on farm to table. 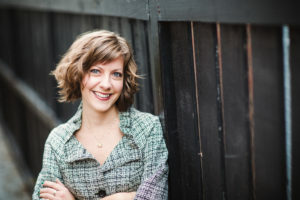 Anne Shadle, co-owner of The Mayan Café, a farm to table leader in Louisville, Kentucky. FF: Bruce, going back to when you started your businesses 20 years ago, how much more difficult was it to get local ingredients than it is today? Chef Bruce Ucán is a co-owner of Louisville’s The Mayan Café. Bruce Ucán: When I opened the restaurant the first time, I had trouble just getting the basic stuff for my Mayan cooking, something simple like chayote… It took me a long time, but I started buying from the farmers. The idea of buying local came along strongly. It has become easier, and it has become cheaper… It’s different not just for the restaurants, but for the people buying. 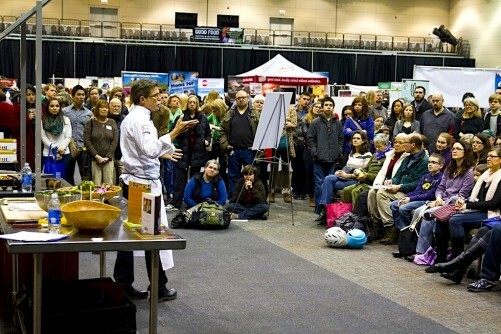 FF: Have you been able to get local farmers to produce specialty items that you need for your cuisine? 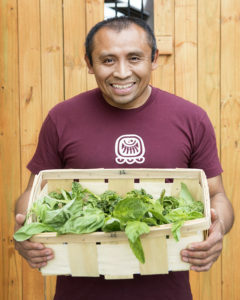 Ucán: A farmer approached me just last winter, and he asked me, what can I produce for you. He is from El Salvador. … He said, “I want to grow something different than the other farmers, the regular potatoes, the regular kale or whatever.” … So I tasted some of his jicama, and it was unbelievable. It’s not cheaper, but we have to think about a different level, vision, for vegetables here. FF: As long as you’re transparent and being straight about what you do, people are going to trust you, right? 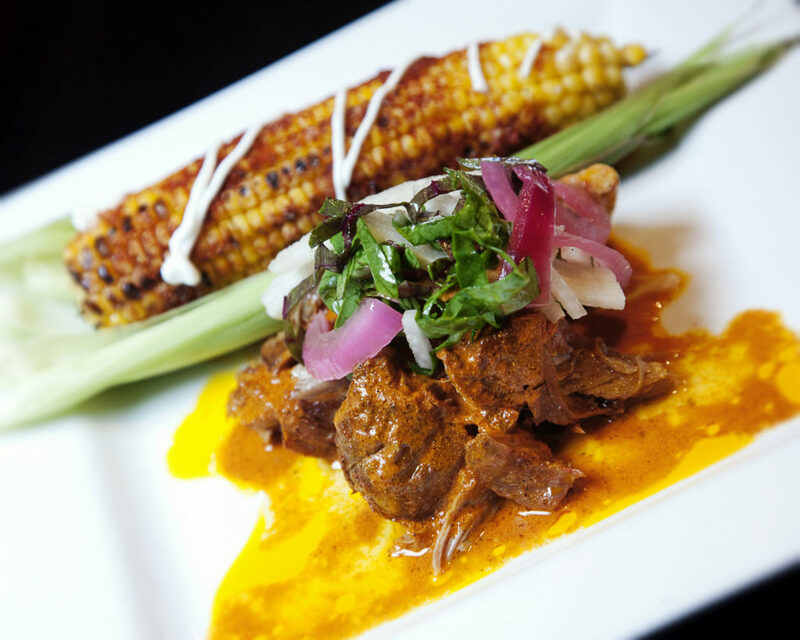 The Mayan Café’s Conchinita Pibil is made with pork (from two local producers), achiote sauce, the restaurant’s signature lima beans, served with a Yucatec tamale of roasted corn. The cuisine is based strongly on the traditional cooking of Chef Bruce Ucán’s native Yucatan Peninsula in Mexico. The thing that distinguishes us [from other local farm to table restaurants] is that we are Mayan Café. So we focused on how we do this so we don’t lose our unique angle and brand. So let’s filter through the menu and put the most traditional Mayan dishes on the menu and have that be a standard thing that doesn’t change much throughout the year. And every month we’ll have a seasonal special menu that has some thematic ingredients to it. We have just two or three dishes on that menu with a wine or a cocktail, and that menu changes every month. That’s how we can really take advantage of all of the fresh produce and things like that, and keep the regular menu standard so that we know from an inventory and purchasing perspective exactly what we have to have. FF: The price you pay for your sourcing is a very important point. The most important word is relationships. This seasonal salad from last summer featured local fruit. 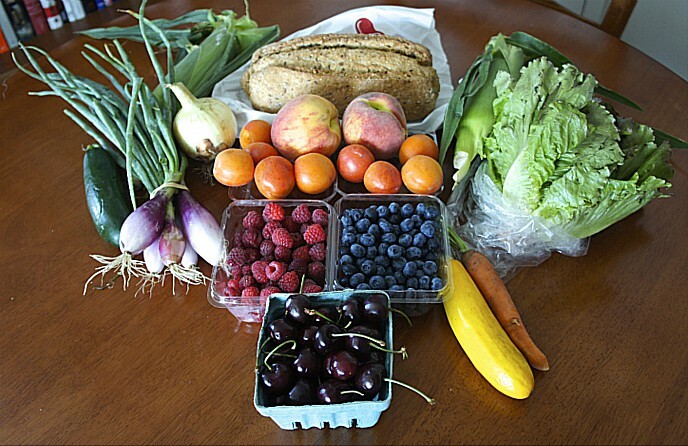 Shadle: Bruce still goes to the farmers market every single Saturday morning. We get a lot of deliveries directly from farmers to the restaurant. But he goes every Saturday to maintain those relationships and touch base with them, see if there are new farmers who have come to the market, just keeping a hand on the pulse of the growing season and the farmer community around the city. FF: I understand that you also have been ahead of the curve on working you’re your customers on their allergy and food restriction issues. All photographs courtesy of The Mayan Café. This entry was posted in Craft beverages, Family Farms, Farm to table dining, Farm to Table: Keeping It Real, Farmers markets, Food and community, Food and health, Food Entrepreneurs, Good Food Dining, Good Food restaurant trends, Local Food, Restaurants and Good Food and tagged FamilyFarmed, Farm to Table Louisville Kentucky, farm to table restaurants, Farm to Table: Keeping It Real, Good Food, Good Food movement, Local food sourcing, Louisville Kentucky restaurants, Sustainable food sourcing, The Mayan Cafe Louisville. Bookmark the permalink.